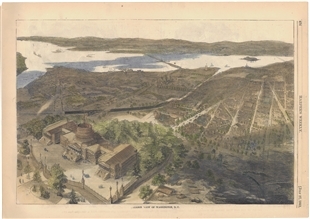 When this print was made, the nation awaited the start of the Civil War with interest. 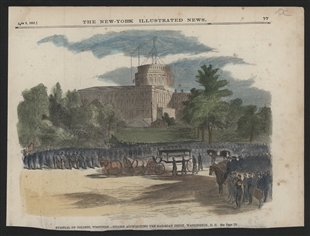 Harper’s Weekly touted its ability to satisfy readers’ hunger for news with innovations like hot air balloons that allowed “artist-correspondents” to show entire battlefields. Until there were battles, they made do with images like this one, of Washington at the start of war, with the unfinished dome of the Capitol in the foreground. Funeral of Colonel Vosburgh - Hearse Approaching the Railroad Depot, Washington, D.C.